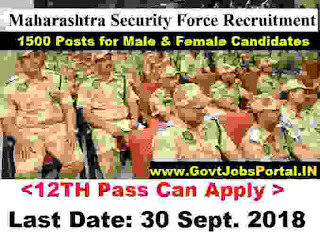 Through the Maharashtra Government Official website, whose link is as follow “ www.mahasecurity.gov.in/”, we come to know this latest Government job opportunity. On their official website they shared a notification in PDF format related to this recruitment process, we share this information on that basis of that Notice only. Government of Maharashtra is looking to recruit 1500 Security Guards in their Force. More information and detail about these Government jobs for Security Guard posts is given below in this article. Read the whole post carefully before applying for these Security Guard jobs. · For Male Candidates: 1000 Posts. Pay Band: Rs.14000 per Month. Education: All 12th pass candidates can apply for these Security Guard jobs in Maharashtra. This is a good opportunity to grab a Government jobs for 12th Pass candidates in India. Age Bond: All applicants who are wishing to apply these Latest Govt jobs must have age in between 18 years to 28 years. Those who lies in between this age figures can apply online for these Government jobs in India. 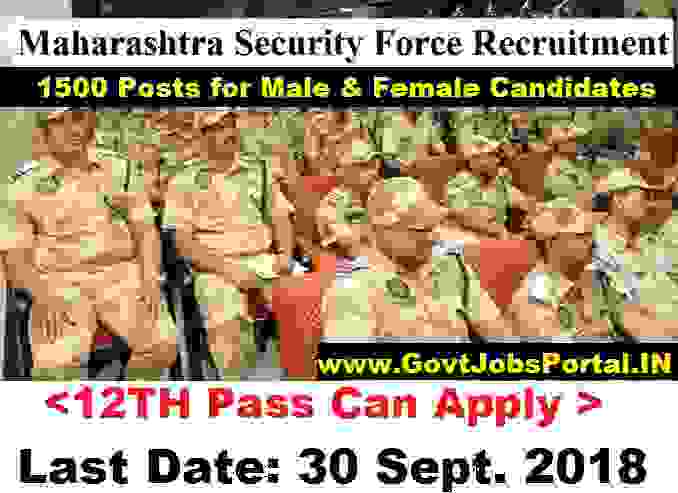 All Fresher Indian Qualified contenders have to apply online at Maharashtra Security Force’s website. The link of the website is as follow: “ http://www.mahasecurity.gov.in/)”. The link will be activated on 19th Sept. 2018 and will be remain activated up to 30th Sept. 2018. All eligible and interested candidates have to apply online between these dates. 30th Sept. 2018 is the Last Date to Apply.